20 Places to visit Santa in Devon and get Festive. There’s no getting away from it, ‘Christmas is coming’ and Devon is busily preparing on its mission to get everyone into the Christmas spirit. 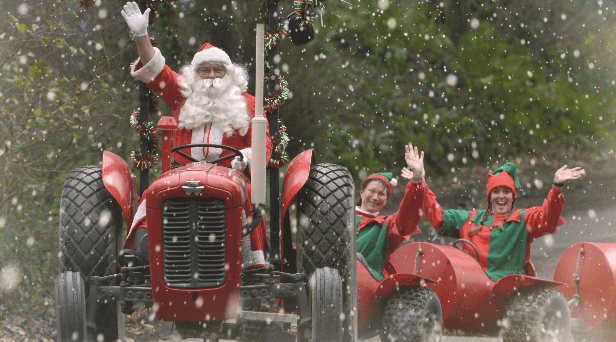 Devon’s Top Attractions have a wonderful selection of festive offerings and meet Santa experiences, full of magical wonder and excitement that’s sure to add to the anticipation and build up to the big day. Finding Santa across Devon will be easy; he’ll be busy visiting the top attractions, meeting the children and helping to put an extra sparkle into that pre-Christmas obligatory Father Christmas visit. Enjoy an unforgettable experience by taking breakfast or afternoon tea with Santa or visiting him in one of his many Devon Grottos. Brand NEW and for the very first time in the UK, you can take a trip on the magical Christmas ‘Train of Lights’. This truly spectacular illuminated journey starts at Dartmouth Steam Railway’s Paignton station, where a period carriage awaits you – settle back into your seat and wait for the dazzling light show to begin. You will be propelled through the techni-colour Greenway tunnel and on into the ‘Enchanted Forest’ which has been transformed by a multitude of lights into a nocturnal extravaganza. Be greeted by the twinkling lights of Dartmouth before you make your return journey to experience the spectacle from the opposite direction. It that’s not enough, the famous Santa Express is also running until Christmas Eve and this year features Snow White and the Seven Dwarfs. Christmas at National Trust Killerton is always a joyous experience, this year they have sparkling displays with Killerton House transformed into the icy world of the Snow Queen, inspired by Hans Christian Andersen. The story continues outside where you can follow the twinkling trail through the garden and parkland. On selected dates you can meet the traditional Victorian Father Christmas dressed in green. And there’s more festivities at NT Castle Drogo with a trail you can follow through the garden to find Father Christmas himself. There’s a Crealy Christmas Spectacular on offer this year at Crealy with ten brand new attractions, featuring the South West’s first ever Christmas Ice Show in their heated Big Top Arena. Watch the sensational international ice skaters and aerial artistes perform in this magical extravaganza. Then enter Santa’s Magical Toy Shop, where every child gets to choose their own present and join Mary Christmas and her team of merry cookie makers in her Christmas bakery as she shows you how to decorate your own festive gingerbread treat. It’s ‘Walter’s Winter Trail’ at the Donkey Sanctuary this Christmas, help Walter keep warm this winter and get a prize on completion! 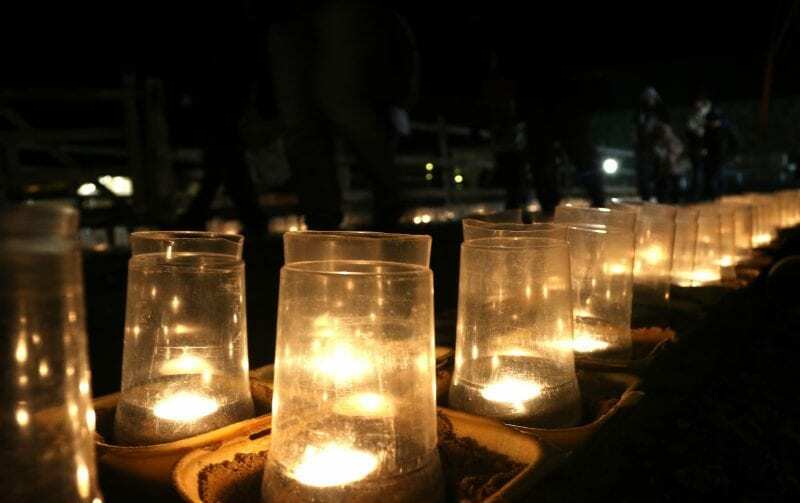 Enjoy an evening of carol singing by candlelight at The Donkey Sanctuary. Get the whole family caught up in the true spirit of Christmas at Pennywell. Adults and children can take part in the Nativity or simply watch the delight and wonder on the children’s faces from the cosy straw bale seating as the greatest story ever told comes to life. A magical manger setting with all the Pennywell animals joining in. The magic continues when every child will be greeted personally by Father Christmas to receive their Christmas Gift. A warm festive welcome awaits in the Café where the smell of mulled wine and delicious mince pies fills the air and there’s a breakfast with Santa on some of the dates too! Back by popular demand is the ‘Polar Express’ Tram ride at Seaton Tramway, relive your favourite Christmas film! Take the magical tram ride to Santa’s home at the North Pole in one of the specially decorated single deck tramcars. Enjoy a hot chocolate, a delicious treat, speak to Santa and admire the awesome lights while you make your journey to the North Pole. Head to the Milky Way Adventure Park and meet Santa, explore Buzzlewick’s Elf Emporium, decorate gingerbread and make Reindeer Food. Help Father Christmas to sort and load the children’s letters ready for him to take back to the North Pole. A fun-filled festive family day out for all. Sail with Santa onboard Stuart Line Cruises, a great way to see the man in red, cruising up the calm and sheltered waters of the stunning River Exe and plenty for everyone to do on this fabulous hour-long trip. Or enjoy a special festive River Cruise on board their festively decorated boats while enjoying a glass of homemade mulled wine and a tasty warmed mince pie. Dreaming of a blue Christmas? 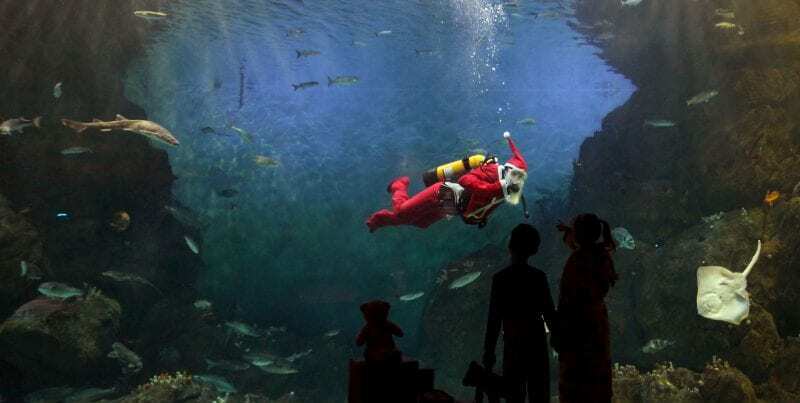 Fortunately, the National Marine Aquarium has got this covered with their Christmas at the Aquarium. Enjoy the special Christmas crafts and events with the focus this year on ‘Magical Migrations’ Take the winter trail around the Aquarium for families to work together and find the clues. You might even be lucky enough to catch a glimpse of Santa himself diving in the tank with the sharks and rays and watch him feeding the fish. Take a ride on the Pecorama Santa Special. Back by popular demand are the Santa Specials on the Beer Heights Light Railway. Experience the Santa Special Train followed by a visit to Santa with a Christmas treat for the children and a traditional Christmas refreshment for the adults. Under 12’s can then let off some steam in the indoor Play Station.There’s Santa Sundays at Dartington Crystal, take the little ones along to meet Santa in his Mary Poppins themed grotto and enjoy a day of festive fun for all the family. There will be grotto gifts, face painting and themed glass painting and don’t forget there’s a great shopping experience there too! There’s another Victorian Christmas to enjoy at Bygones, Torquay with a 12-foot tree and a special festive hunt and breakfast, brunch and lunch dates with Santa. Just down the road at Kents Cavern you can join the fun this year with another incredible Santa Show. This underground experience is guaranteed to bring out the child in everyone and put the joy and wonder back into Christmas. Take the train ride to visit Santa in his underground grotto at Morwellham Quay and receive a present. Each child can bake some festive bread in the bakery and paint their own Christmas tree decorations, while the adults can enjoy mulled wine and mince pies in The Ship Inn. South Devon Railway have got Christmas all wrapped up with their ever popular ‘Santa by Steam’ experience, an unforgettable festive journey on a real steam train. Enjoy the entertainment and meet Father Christmas in his magical grotto where every child receives a gift. There’s a special ‘Santa in the Dark’ evening on the 18th December and two special ‘Carols down the Line’ train evenings on 6-7th December with complimentary refreshments thrown in! Head to the Big Sheep for Woolly’s famous Christmas Wonderland, explore Santa’s Grotto and meet the man himself! A magical mysterious grotto bursting with Christmas creativity bringing seasonal magic and festive charm to all who visit. 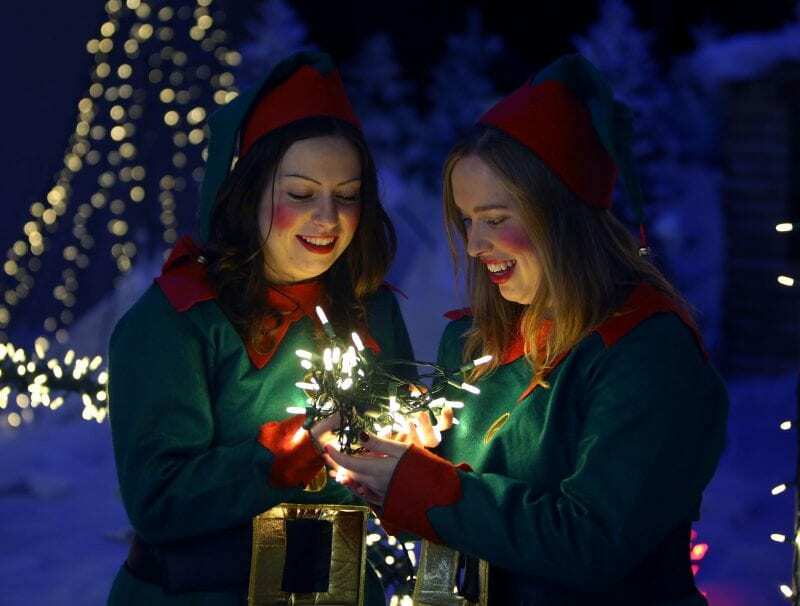 Meet Santa and his elves, see the spectacular lightshow, on throughout December until the 31st. Plus, there’s Christmas Markets at the Big Sheep on Saturdays throughout December full of local food and crafts. The Christmas fun carries on after Christmas with the famous Boxing Day Barbecue at Clovelly Village and some Mince Pie special trains at South Devon Railway which run from 27th December until New Years Day.